B. S. G. Wheeler : Surf-Board Riding, Hawaii, 1918. 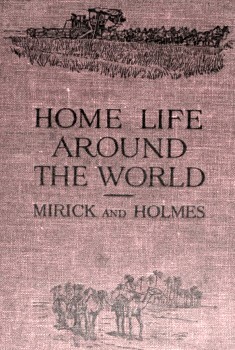 Home Life around the World; a geographical reader for the fourth grade. 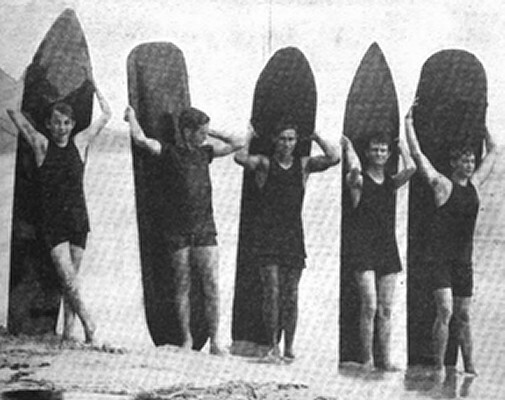 Burton Holmes visited Waikiki circa 1908 and used photographs fo surf-riding to illustrate his travel lectures. 10. But Kaluhe had his play hours as well as his hours of listening to Nalima's stories and of helping her at her work. He used to wander off into the jungle with the other children of the village, where he picked berries, and climbed trees after wild bananas and oranges and coconuts. And there was the ever-inviting seashore, where he hunted crabs, caught shrimps in a net, and gathered seaweed. All these were good for food after Nalima had cooked them in the hole in the ground, their only stove. And there was bathing and swimming in the surf, and, when he was old enough, he learned how to skim over the breakers on the surf-boards. Sometimes he was allowed to go out (page 113) with a fisherman in his odd-looking boat. into his net, or pierced them with his slender spear. These boys are showing you their surf-boards. How long are these boards? How wide? 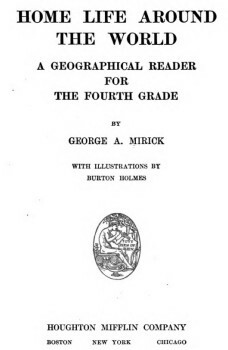 a geographical reader for the fourth grade. 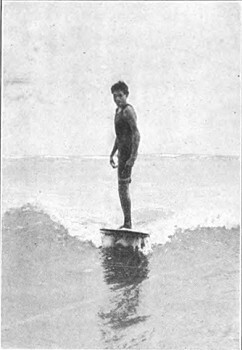 Geoff Cater (2017) : Mirick and Holmes : Surf-Board Riding, Hawaii, 1918.